I’m still wondering if UBC will still be subsidizing the ~$3/month it currently does? hmm maybe i should be EA again. YEAH REFERENDA! As far as we know, the current UBC-AMS U-Pass Agreement will stay in effect, making us assume that the $3 will continue. Of course, with an increase in fees will come our insistence on increased assistance. I have a lot to talk to UBC about now, it seems. thanks for the clarification, Taylor and Jmac! If only the u-pass was actually sparkly…. sigh. If the referendum for the fee increase fails does that mean students are rejecting the u pass all together? I assume that is correct because I don’t think anyone would prefer to pay an few extra dollars each month. The only reason that people would vote in favour of a price increase was if the alternative was the regular price transit pass, which is much, much more expensive. Also, congrats to the schools who are getting a cheaper u pass or getting a u pass for the first time! this very grateful blog and infomatic i want to bookmark it . “Schools will have to follow five steps to join the U-Pass BC Program, including consulting with TransLink and student societies on the details of the program and reaching a contract that includes the school’s agreement to administer the U-Pass BC Program. 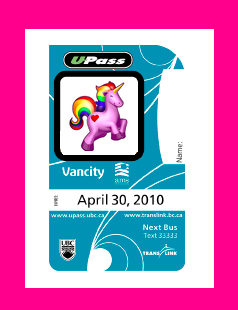 Translink’s motive in the u-pass is to encourage young people to continue taking the bus, Skytrain, SeaBus, or West Coast Express etc after they graduate and become ineligible for the u-pass discount. (If you ask, nicely, TransLink will be more than happy to produce statistics showing that university students in Vancouver overwhelmingly switch to automobile transportation after graduation.) Also, it should be noted, that no public transportation authority re: TransLink ‘makes’ money in a typical business sense, and whatever it ‘makes’ -mostly through ticket sales and advertising- are lost through programs like the u-pass. For instance, you and I can now ride anything, anytime to anywhere for as long as we are enrolled at a public university. Except we only pay $30 a month, while a non-student adult would have to pay $150 a month for the same three-zone pass. So for every 1 of us, TransLink loses $120 dollars a month in theoretical revenues based on the notion that every student would buy the three-zone monthly pass. Also, if more people took transit the advertising rates would go up = small gains. TransLink is not as much of a planning department as it is political organ that solely bases its decisions through politicking and partisanship of whomever runs the organization (i.e. TransLink doesn’t do the nuts and bolts). The cool stuff (plans, ideas, vision) happens on the city department level re: Vancouver Downtown Trolley, bike paths and bike lanes etc. TransLink is more of the judge, jury and executioner who take their orders from Victoria. Example being that if a city department has an idea that ‘fits’ within the views of the current Translink mandate or Executive Board, the board would then try to promote the idea through its various means. If not, it gets ignored; or in some cases ridiculed.